Streetfilms & Congestion Pricing Over the Years! March 2019: Congestion Pricing will save Lives in NYC! 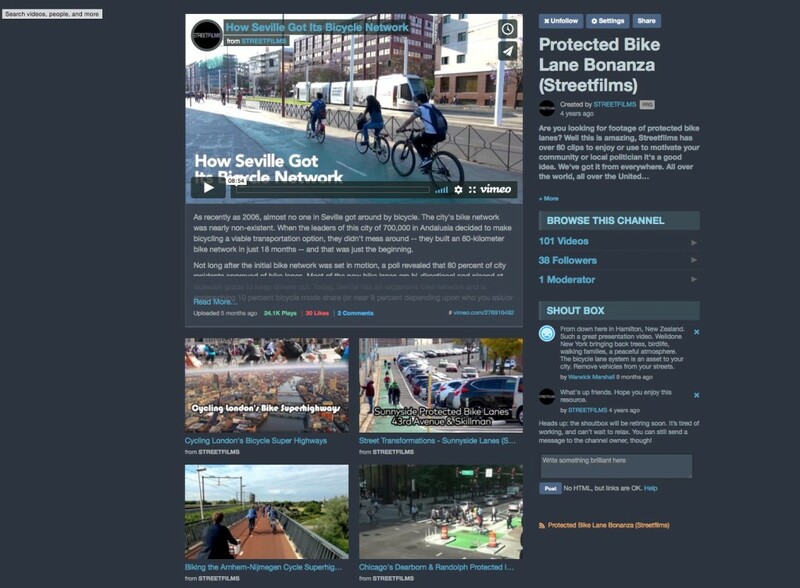 There are now 100 Streetfilms featuring Protected Bike Lanes for your advocacy! Well congratulations to us! We've now posted our 100th Streetfilm that features elements, designs or pilots of protected bicycle lanes all over the world. But really it is congratulations to you, too, since you just have that much more evidence to show your elected leaders and cities that this type of safe design works. To celebrate, I thought I'd point you towards some of my personal favs and those with useful content. It's extremely hard to choose, but here are my Top Five. Please don't be limited by these! I made this Streetfilm over 8 years ago and it still holds up smashingly well. I've lost count of the hundreds of messages I have gotten over the years (especially the first three years it was up) of advocates, politicians and neighborhood leaders who told me having this film to screen/share totally changed the game in their fight for better lanes for their city/town/state. And at nearly 350k plays (that I can count) it's the fifth most popular Streetfilm of all time. Best story from this trip: Within minutes of arriving to my hotel I saw my first platoon of about 30 cyclists heading towards me. It's like I had seen a bike unicorn and I hurriedly raced to capture it on film, severely spraining my ankle in the process. Of course the same scene of bikes continued over and over. All day. Dopey me. Thankfully, biking proved to be the easier method of getting around as I was walking was so badly I probably should have been on crutches the 5 days! A few years ago London's first Bicycle Superhighway lanes opened to much fanfare and immediately were filled up during rush hours by thousands of commuters. In fact, the Central Business District now has almost equal numbers of bikes and cars entering daily. There were scores of photos and short clips of huge masses of cyclists dominating the Twitterverse but really almost no substantial video reports of the lanes. So I felt it was my duty to get there this past summer and talk to many London residents about them and see for myself these immensely wide, beautiful structures that admittedly can make you get jealous! And a related Streetfilm that details how an advocacy group formed to organize business leaders to push for the lanes is also a great watch! This is a straight forward, nuts and bolts documentation of some of the work NYC DOT pulled off in what once seemed like an impossible task: to create a safe and working protected bike lane on Queens Blvd, once named "The Boulevard of Death". This was following Mayor de Blasio's allocation of millions of dollars to reformat the roadway in the wake of his passionate support of Vision Zero. Then at NYC DOT (now the head of Oakland, CA's DOT) Ryan Russo detailed the how every-block-is-different design came about. I really wanted to make this as a historical document and thought it would be a little dry, especially a 10 minute film with only one speaker. But this ended up a pretty popular Streetfilm with scores of curious folks around the country watching and other city transportation departments and students studying it. Made in 2013, it is the third most popular Streetfilm of all-time! At this point in my life I had been to Copenhagen and Amsterdam, two cities that do bicycling right. But I absolutely fell in love with the silence and breathtaking beauty of Groningen in the north Netherlands. For one, I laughed while walking the mile from the train to check into my hotel. Why? I didn't see one car! People seemed so happy. It was like Disneyland for bikes. Besides the excellently designed bike infra, there is also a traffic circulation plan built in to the city that forces cars to detour to longer routes making almost every trip you can do either faster by bike or competitive to the point that you might as well not own a car. Okay, the fifth one is actually a tie (yeah, I 'm cheating a bit). But both of these Streetfilms have been very important in the struggle for holding on to very important bike lanes implemented by NYC DOT that were under assault from local communities vehmently opposed to losing parking and road space. In both cases, families and groups in favor of the lanes wanted to provide a powerful visual of the lanes in use, so they both planned celebratory rides that put children out front. The top is the Prospect Park West Family Bike Ride, which in April 2011 was under attack by a Brooklyn group called "Neighbors For Better Bike Lanes", who - shockingly - really weren't for better bike lanes at all! They were suing the city for their removal (eventually they lost over and over) and had uncomfortable ties to former NYC DOT Commissioner Iris Weinshall. That's the skinny, but you can read all about it here in the Streetsblog archives. The bottom is almost the nearly the same video but seven years later in the Sunnyside community of Queens where the struggle to initiate an integral pair of protected bike lanes on Skillman & 43rd Avenues went bonkers. It featured tons of Community Board drama - which still continues today - and a similarly themed "group" called "Queens Streets for All" which is really just about fighting for free car parking on the two streets. Watch both videos and you'll see why if you have a bike lane in your neighborhood you should bring out families! Binge on Streetfilms shorts/excerpts from Barcelona, Seville & London! When I take a trip (especially to Europe) I usually plan for a specific Streetfilm to make in each city. For example, here were my identified goals for my recent 8-day loop thru Barcelona (Super Blocks), Seville (History of Bike Lanes) and London (their Bike Superhighways and more). But as is almost always the case, when in Europe I see lots of cool transportation thingys or nifty practices I can't resist even in the midst of documenting my main goals. So it happens, I grab a few shots and turn them into shorties or just a bit of a montage that I hope people might find useful or enlightening. Now let's jump to Seville which has an incredible bicycling story of going from nearly zero riders to closing in on 10% after installing a full network. This link is the main Streetfilm I posted which is nearing about 75,000 plays combined on Vimeo, Youtube, Facebook and Twitter. But I got lots more story than that, especially some useful clips that were cut from the body of my Streetfilm for time that I repurposed as cutting room floor teasers! Above this paragraph is a short on how residents navigate the tram tracks to reposition themselves on the other side of the cycle track by following medallions/markers inserted on the pavers in the historic downtown. Also above is a direct trim from the feature attraction featuring Manuel Calvo Salazar that I felt might be useful to planners or advocates showing how Seville positioned its bike lanes behind the many bus stops on its major roads. So that proved popular. And then below I had a few cute shots of kids on rollerblades going out on the protected bike lanes, showing how safe residents feel they are despite the narrowness in many areas. And finally, I am also editing down my London footage as well to prepare a nice film looking at the popularity of the Bicycle Superhighway system. But wouldn't you know it, I also just happened to be in town the day a brand new public space years in the making debuted. So it was off with Iain Simmons the Assistant Director of City Transportation for the City Of London to check it out. I mean, how could I refuse even with an absolutely insanely booked schedule? Look for my final films from Barcelona and London coming in the next few weeks! Until then, I hope you enjoy some of this output already. And here below is the Seville feature film if you haven't checked it out as of yet. As you may have heard via Twitter, tomorrow (Thursday, April 12th) I will be covering my 100th event/presser/ride/advocacy push featuring Transportation Alternatives when I join the BikeTrain Kickoff Rally, which will show Manhattan/Brooklyn/Queens bike commuters - or those curious - how to ride to work once the L-train shuts down. I have so many TransAlt Streetfilms, that I now even keep a separate channel on Vimeo where you can watch every one! In honor of the 100th TransAlt video to come it made me decide to go a step further and I have picked my five favorites of them either in terms of quality, fun or effectiveness at informing the public of helping change policy. I love them all, tough to choose. In no particular order, here are those five. Late last year, this short Streetfilm showcased what you can do with a fun idea, a huge gathering and a powerful message. 300+ people made human protected #bikenyc lanes down Fifth Avenue. Fifth Avenue has no bike infrastructure above 26th Street, leaving a large void in the bicycle network where there’s huge travel demand. Protected bike lanes can’t come soon enough: Through the first eight months of this year drivers injured 15 people biking and 28 people walking on Fifth Avenue in Midtown, according to city data. A very powerful gathering and march organized by Families for Safe Streets took over the streets of NYC from City Hall and marched to the United Nations. I tell people who are curious as to why I chose to do what I do that they should simply watch this film. The speakers in it say far more than I could in a few sentences. The "We Ride the Lanes" event was the brainchild of Mitch Sonies, who rides the PPW bike lane with his six-year-old daughter and wanted to do something positive to highlight how much people appreciate having a much safer street in their neighborhood. "It was a real celebration of this great, safe bike path," said Mitch. Together with the organizing power of Transportation Alternatives this much-needed power boost to support the new green protected lanes by Janette Sadik-Khan was a slam dunk success in the media and the minds of Brooklyn and NYC bike riders. Jorge Canez, the man behind the mask, has been a pedestrian advocate for quite a while and in Mexico City and he's been involved with many tactical urbanism types of interventions but it's as Peatónito fighting for a safer city that gets him the most notoriety: gently scolding drivers, escorting pedestrians though dicey intersections and pushing vehicles (or occasionally walking over the tops of cars) to get drivers attention to their bad behavior. Needing a great speaker and event to give the conference some zing, Transportation Alternatives brought him to NYC for the Vision Zero Cities 2016 Conference and a group of staff and volunteers got to see him in action at some dicey spots throughout the city. From 11 years ago! Before we had the Bloomberg Administration getting more serious about bicycling and transportation, Streetfilms decided to get serious with this huge expose (150,000+ plays and counting!) that NYC needed to get serious and look at the problems on our streets and the solutions in other places. Remember this was many months even before the wonderful Janette Sadik-Khan was installed as NYC DOT Transportation Commissioner. This film was produced with a lot of advocacy featuring Transportation Alternatives, Project for Public Spaces, NYC Streets Renaissance and many others. It was a pivotal moment and tool in the fight for safer streets in NYC. It features Paul Steely White, Caroline Samponaro, Mark Gorton, Andy Wiley-Schwartz and - even me!